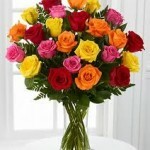 Ok friends here is our week 2 offer for the Flower Express flower or the month. 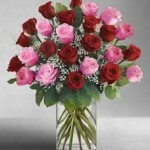 Two dozen roses arranged in a vase with greenery and babies breath for Only $55.95!! Usually this would cost you $85.95. Can you believe these savings?!! This does not include tax or the $7.95 delivery fee if you want to send them to someone. Also, colors of your roses will vary upon availability per shop location and this offer is only while supplies last so call or come in soon. Don’t forget our $5 wrapped roses. Only Thurs. & Fri. thru August. Filler/greenery additional. 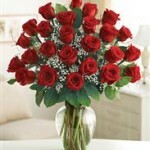 Next post: $5 Dozen roses, really???? Yes, really!! !